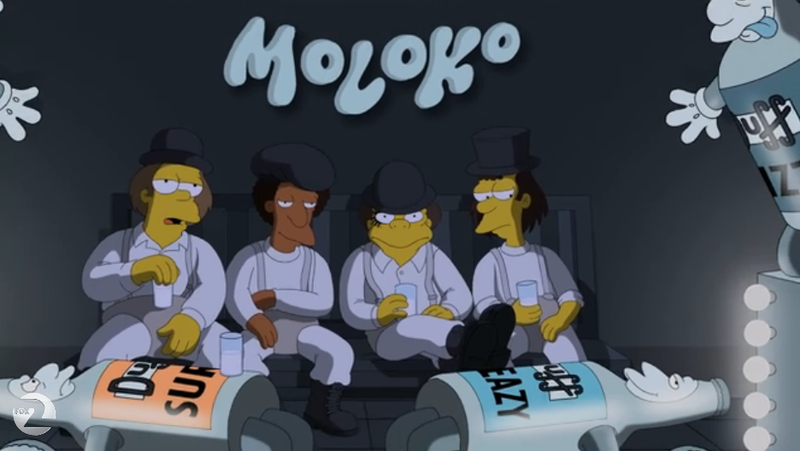 Each year, The Simpsons tickles our funny bones with a trio of horror-themed tales, and this year's Treehouse of Horror delivered one of our favorite Halloween segments yet: "A Clockwork Yellow," which starts as a parody of A Clockwork Orange and gradually becomes a Stanley Kubrick free-for-all. Truly, "A Clockwork Yellow" is fantastic just for its straight parodies of some of A Clockwork Orange's key scenes. (The timelapse sequence played out between Homer and Marge is particularly grand.) But when Moe and his droogs wander into a party out of Eyes Wide Shut, the Kubrick references start flying and we love every moment of it. That wasn't the only great moment from this Treehouse of Horror; the first segment contains a hilarious joke about Catholic heresy and the endless Simpson family iterations and mashups in the final segment are so much fun. Plus, the opening gag is delightfully gruesome.